As is sometimes the norm, stories travel and connections are sometimes made in the strangest of situations. This very situation recently happened to me. A new Lakehead University Thunder Bay colleague recently made a visit to the Orillia campus to meet the staff and faculty here. In a random conversation with another colleague, she mentioned a sad story of her sister’s family and their pet. The story was sad because her sister and family had come to the conclusion that they could not house their family pet, who happens to be a snapping turtle, for much longer as they just didn’t have the right equipment to care for her. 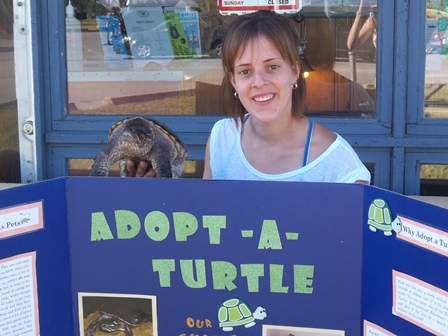 This is the story of Coco and how she came to be the newest addition to the Kids for Turtles family. At 16 years of age Matthew (now 24) had a friend whose parents were going to pave over an area in their yard. Matt who had seen a snapper laying eggs in that area earlier in the season, dug up all the eggs and brought them home where he buried them again. He waited patiently for the day they would hatch, and hatch they did……..about 30 baby turtles. He kept them for about 3 days before taking them all to a pond to be released, all except for Coco. Coco was born with only one eye and a stubby tail and Matt knew she did not stand a chance. So Coco became part of the family. In the summer he would let Coco walk around in the back yard, and swim around in a kiddy pool. A couple of times Coco fell in the family pool and Matthew had to dive in and rescue her because she just sank to the bottom. Eight years later of course Coco is not a little baby turtle anymore, but is growing to a healthy size, and Matt has gone off to university. As a result she is now residing in the family’s bathtub, where she gets lots of attention and all she needs to eat, but the family knows she will only get bigger and will outgrow the tub as well. Kids for Turtles is pleased to say that the family was thrilled to allow Coco to come and live with us where she will be a welcome addition to our family and a very important part of our educational outreach program. Make sure you stop by our office at Tudhope Park this summer or at our booths during one of the many events we attend throughout the season to say hello to our Coco.